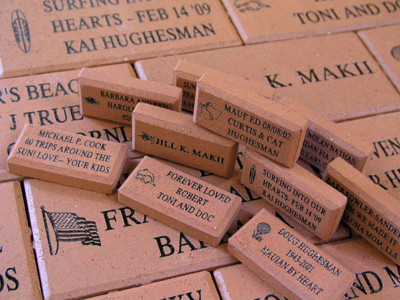 From wedding dates, to loved one’s names and special memories, these commemorative bricks are a great way to make your memory last forever at the Flamingo Hotel. Located in the Flamingo Gardens at the Flamingo Hotel, the option to engrave a brick and have it installed into the gardens is an option that you will not want to miss out on. These bricks are great to give as gifts and are also great to preserve memories. Each brick is 4” by 8” and costs $200. One brick can have up to 3 lines of engraving. To have a brick engraved, fill out the commemorative brick form and mail it to the Flamingo Hotel. Bricks will take up to three months to be completed and displayed after filling out the form. Once bricks are completed and installed, a certificate with the location of the brick will be sent to the owner. There’s so much I wanted to make a memory of with these bricks. This is truly a great way to make your memory of Flamingo Hotel last forever. Each brick costs $150, so it’s a little on the pricey side. I think it is worth it. If you’re looking for something different to do, check this out! My husband and I got a brick made in honor of his father, who loved coming to the Flamingo when he was alive. Its such a sweet memory for us.